There are few structures in America to match the splendor of the United States Supreme Court building in Washington. Built during the Great Depression at the urging of former President and then Chief Justice William Howard Taft for less than $10 million dollars, it is a Neo-classical temple of justice. Architect Cass Gilbert studied the great temples of Europe and designed this building to embody the mission above the entrance, “Equal Justice Under Law.” White marble from Vermont, Georgia and Alabama clads the steel structure, and sculptures of historic law givers such as Solon, Moses, Muhammad and Confucius appear on the eastern pediment. Within the building are portraits and statues of great justices of the Court, and on the upper level is a gorgeous library. However, the holy of holies is the Court Chamber, a formally designed room dominated by the mahogany “bench” at which the justices sit. Details of their dress, entrance and exit, their order of seating and speaking, and other court procedures, are all governed by tradition. The overall effect is to exalt the principle of justice. When the cornerstone was dedicated in 1932, then Chief Justice Charles Evan Hughes stated, “The Republic endures and this is the symbol of its faith.” While the Capitol building is much larger, and the White House effectively exalts the power of the President, it is the Supreme Court which most feels like a mishkan, a tabernacle where the highest ideals of the nation are embodied. Turning to our parashah, until this point the Torah has focused on people—the stories, struggles and lessons of their lives. We have not yet encountered any building other than the tent of Abraham and Sarah. The remainder of Exodus will focus heavily upon the great project of constructing a mishkan—a dwelling place for God—which will contain symbols of divine presence and instruction, and will also be the locus of Israelite worship. Diagrams of the tabernacle compound show it to be a rectangle made of two contiguous squares. At the center of one is the altar; the second center is the holy ark. This design implies a symbiosis, with Israel sending its devotion skyward, and treasuring the revelation that was received from heaven. While this vertical metaphor for divinity has been much maligned, the instinct to “lift my eyes to the mountains, from where will come my help” gave our ancestors a sense of transcendence that allowed them to transition from slavery to freedom. Parashat Terumah focuses on the materials and dimensions of the tabernacle. Each year I am drawn to the acacia wood planks, atzei shittim omdim, that were plated with gold and stood upright to form the walls of the tabernacle. These were bolted into place by the wooden rods, brihim, that ran from one end to the other, with five on each side, resembling fingers that contained the holy districts within. In the Talmud (b. Yoma 72a; Sukka 45b) Rabbi Shimon b. Yohai understands that the planks were oriented in direction of growth from when they were trees, indicating that all of the mitzvot may be fulfilled only in the direction of growth (this is also true of the four species in the Lulav). That is, mitzvot are not meant primarily to be reminders of the past, though they may also play this role. The mitzvot are meant to be dynamic—actions that allow growth in the practitioner and in his or her faith. Solomon’s temple would employ “great and precious stones” (I Kings 5:31) as a foundation of the building, but the dominant material of the tabernacle was acacia wood, and even Solomon’s temple was famed for its cedars of Lebanon. Later in the second temple period, the Sanhedrin or high court would sit in the Temple complex in a “chamber of hewn stone,” and perhaps this was an indirect inspiration for our Supreme Court building, with its mighty columns of marble. These buildings, temporary though they may be, are nevertheless enduring symbols of dedication to the highest ideals of a people. It is certainly possible to criticize builders with an “edifice complex” when the mission of making opulent structures masks confusion about ultimate values. Indeed, the tabernacle project of Exodus will be marred in Ki Tissa by the narrative of the golden calf. However, the buildings also can concentrate the focus of a nation upon its highest ideals. 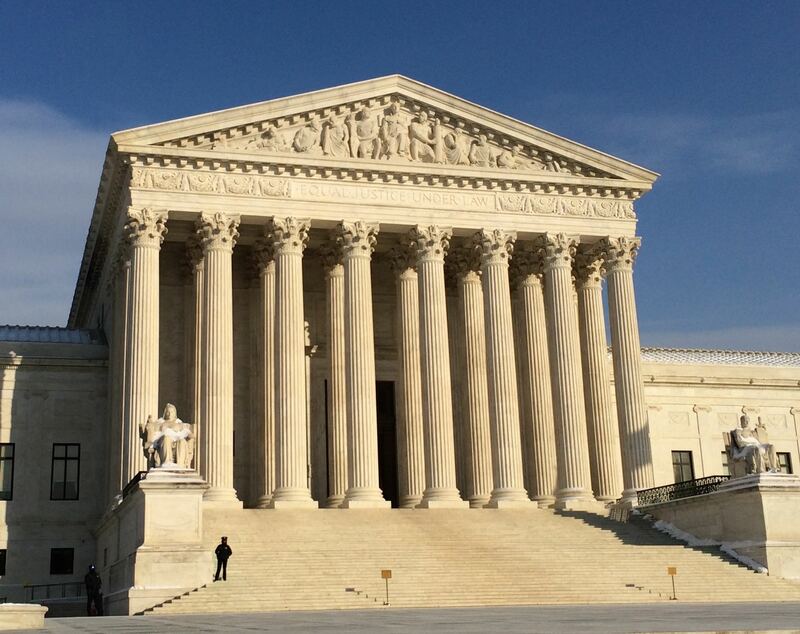 In the case of America, that ideal is justice, and it is marvelously embodied by the Supreme Court building. Justice is also central to Israel’s value system, but it is a foundation for a yet higher calling, to create a holy nation. Kedusha, the idea that our lives can become sanctified in service to God, is the purpose of building a mikdash, or holy temple. Without such a physical structure that can be shared by the people of Israel, what remains is our greatest structure in time, Shabbat. It too is an organic construction designed to be both a reminder of our history and an incubator for spiritual growth. אמר חזקיה אמר רבי ירמיה משום רבי שמעון בן יוחי: כל המצות כולן אין אדם יוצא בהן אלא דרך גדילתן , שנאמר +שמות כו+ עצי שטים עמדים. This entry was posted in Divrei Torah on February 20, 2015 by Rabbi Danny Nevins.